These delightful doggie slippers feature in Val Pierce’s fabulous new book Cutest Ever Baby Knits, which contains more than 20 adorable projects to knit. Using toning shades of pale green yarn, knit these cute little doggie slippers in just an evening. The slippers are completed with tiny little dogs’ heads, made separately and firmly sewn on afterwards. Using 3 ¾ mm (UK 9/ US 5) needles and yarn A cast on 27 sts. Row 1: K2, (M1, k11, M1, k1) twice, k1 (31 sts). Row 3: K2, M1, k12, M1, k3, M1, k12, M1, k2 (35 sts). Row 5: K2, M1, k13, M1, K5, M1, k13, M1, k2 (39 sts). Row 7: K2, M1, k14, M1, k7, M1, k14, M1, k2 (43 sts). Beg with a knit row, work 4 rows in st st.
Next row: Beg knit work 4 rows st st.
Next row: K1, *yfwd, k2tog*, rep from * to * to end of row. Work 2 more rows in st st. Break yarn B. Change to yarn A and work 12 rows in garter stitch. Row 3: K8, k2tog, turn. Row 4: K8, k2tog tbl, turn. Next row: K9, then knit across remaining sts on left-hand needle. Next row: Knit across all stitches, decreasing 1 st incentre of row (30 sts). Now knit 2 rows in garter stitch across all stitches. Change to yarn B and work in k2, p2 rib for 23 rows. Change to yarn A and work 2 rows in k2, p2 rib. Cast off loosely in rib. Using 3 ¼ mm (UK 10/US 3) needles and cream yarn cast on 4 sts. Purl 1 row. Next row (RS): Inc in each st to end (8 sts). Next row: Inc in each st to end (16 sts). Next row: (K2tog) 8 times (8 sts). Next row: (K2tog) 4 times (4 sts). Do not cast off. Run thread through remaining stitches, draw up tight and secure. Stitch seam but add stuffing as you do. Close seam. Take a blunt-ended needle and thread yarn through every stitch on the 6th row of st st before the dec row. Draw up quite firmly to form the muzzle of the dog. Fasten off. Using 3 ¼ mm (UK 10/US 3) needles and brown yarn cast on 2 sts. Next row: Inc in each st (4 sts). Next row: Inc in first st, k2, inc in last st (6 sts). Now work 4 rows in garter stitch. Next row: (K2tog) twice (2 sts). Work in all ends.Working from wrong side of piece fold picot edging together, sew the first and last rows in yarn B knitting together, matching stitch for stitch. This will form the pointed picot edge on the right side of the slipper. Sew slipper foot and back seams. Fold over ribbed top in half to form cuff. To complete dog’s head, sew ears to either side of the head as shown in photograph. Using black yarn embroider nose, eyes and mouth. Use photograph as a guide if needed. Stitch heads very firmly to fronts of both slippers. 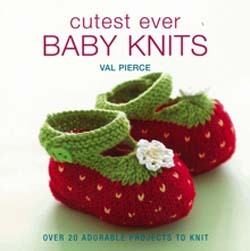 Extracted with permission from Cutest Ever Baby Knits, by Val Pierce, published by New Holland, RRP $29.99. Val Pierce’s new book, Cutest Ever Baby Knits, features an irresistible collection of utterly gorgeous baby clothes and accessories. Along with cute dresses, coats, hats and booties, there are nursery accessories to knit – among them a cosy blanket, a cuddly teddy bear and play blocks. Many of these patterns are suitable for beginners. Created with newborns in mind, several of the projects can also be made to fit babies from 3 to 9 months. A gorgeous book. Thank you so much for this lovely bootee pattern. Isnt it a nice gesture from Ms Val Pierce (the author) to do this. Its nice to see, in a world of grabbing, an unselfish act. I will be heading for the book shop this weekend. Thank you. That’s great Alison! It’s a lovely book. Jane. Les modèles sont magnifiques pourquoi ne pas mettre un lien de téléchargement ? Where can l purchase this book from? Ask your local bookseller to order it in. Or you could order it on Amazon. I think there is an error in the pattern? Only 4 rows of stocking stitch are need before you work the picot row not 8, other wise the section is too long. Like Sheila commented….Is there an error in the pattern? 8 rows of stocking stitch before the picot row not 4? After the picot row, there are only 3 rows. We are supposed to sew the first and last row of yarn B together to form the picot edge. There would seem to to be an imbalance. Please clarify. Thanks . Thank you for your comment. Unfortunately this is a book extract so we cannot comment directly on that. There was an errata sheet released by the publisher with errors in the book, but this particular pattern is not on there. Thank you for your prompt reply. I can’t upload any photos here but it looks ok after sewing the picot edge together. There seems to be another mistake in Row 1 of slippers which I forgot to mention. I think it should be K2, (M1, K9 (not K11), M1, K1) twice, K1 to increase from 27 to 31 stitches. Subsequently Rows 3, 5 and 7 also with K10 (not K12), K11 (not K13) and K12 (not K14) to get a final 43 stitches before the picot edging. Please confirm. Thanks much. Hi, Val Pierce here. Sems the editor has put in the same lines twice on the picot row so there should only be 4 rows as other have stated. Thanks so much for pointing this out. I will inform the publishers too. Me encantan los tejidos de bebe y juguete, muñecas tejidas, es una excelente pagina, muchas gracias y Bendiciones.